Walter Shirlaw original etching "Miriam and Donatello"
Medium: original etching. This etching illustrates a scene from Nathaniel Hawthorne's famous novel "The Marble Fawn" and was executed for "The Hawthorne Portfolio" and published in 1884. Printed on laid paper, the plate size is 5 1/2 x 3 1/8 inches. Signed by Walter Shirlaw in the plate (not by hand). Walter Shirlaw original etching "Hilda and the Doves"
Medium: original etching. 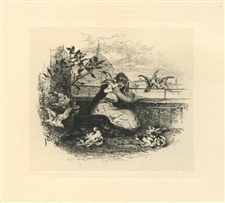 This etching illustrates a scene from Nathaniel Hawthorne's famous novel "The Marble Fawn" and was executed for "The Hawthorne Portfolio" and published in 1884. Printed on laid paper, the plate size is 2 5/8 x 3 inches. Signed by Walter Shirlaw in the plate (not by hand).